When Tim Linhart started making instruments from ice they were more likely to explode with a bang than produce music, but things have come a long way since then. Today, the US-born artist is in charge of an ice orchestra of local musicians playing a series of concerts at sub-zero temperatures in a vast, custom-built igloo high in the Italian Alps. “I made snow and ice sculptures in the ski resort where I’m from in New Mexico (for 16 years)… and then I decided it would be cool to make a sculpture of a violin,” Linhart, 59, told AFP. “I heard the sound coming from inside and thought ‘wow this is super exciting, if I just tighten up the strings a little bit more it would be louder’,” he recalled. Overtightening the strings, however, caused the instrument to shatter into little pieces, he recounted. “But I had heard enough, it was the beginning,” said Linhart, his large frame treading nimbly among the delicate instruments on stage in the igloo. In the Passo Paradiso winter sports station at an altitude of 2,600 meters (8,500 feet), instruments still at times spontaneously implode due to the brittleness of the ice, but less frequently. And when they do, it’s not altogether a lost cause. “Then you know you’re as close to the edge of ice music as you can get,” Linhart said. Here, the artist has built a violin, viola, timpani drum set, xylophone, double bass, mandolin, cello and even his own invention, the giant Rolandophone, a huge percussion pipe instrument, all from ice. After molding front and back plates, Linhart uses a white-ice mix of water and snow to build the instrument’s walls, around a metal backbone, over which the strings are stretched and tightened. A mandolin takes five or six days to make, bigger instruments can take months. Because of their weight, some of the instruments are played while suspended from mountaineering carabiners attached to steel cables drilled into the ceiling of the 200-seater igloo. For storage, many are kept in niches carved out of the igloo walls. 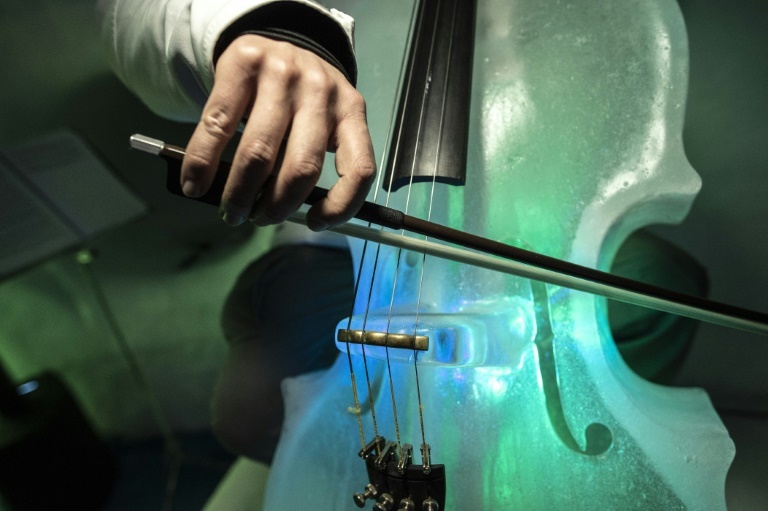 Cellist Nicola Segatta, who helped build his own instrument out of ice, says their sound is “more crystalline” than the classic wooden instruments. “They’re incredibly fragile. When you’re building them there’s the constant risk that they’ll disintegrate into a thousand pieces,” said the musician, who had been part of the orchestra that day. But the intensity of the music produced by the ice instruments brings out a strong emotional reaction in the audience, in counterpoint to their fragility, he added. The ice instruments require amplification, and technicians battle constantly to keep the sound coming in the adverse conditions. As the audience enters the igloo, where temperatures average minus 12 degrees C (10 degrees F), it begins to warm up, and so do the instruments, forcing the musicians constantly to retune. But the ice’s flexibility is also a blessing, as it adapts to being played. “The instruments when they’re first newly built, they sound kind of tinny, a weird-sounding little thing, and the more you play them, the bigger the sound gets,” Linhart said. Linhart spends the summer with his Swedish wife and their young son in northern Sweden, gardening and creating non-ice art, while some of the better instruments are kept in a freezer for the next winter. “If they’re old and worn we’ll just hit them with a hammer or leave them out in the sun and let them die,” he said. His current project is teaching people like Segatta how to make the instruments, and the concert hall, themselves. But this means resisting the constant temptation to think up even bigger instruments in “the cutting edge, the invention side of ice music again”, he said.